Rice has long been a staple of menus, but the usual white and brown varieties aren’t cutting it anymore. Many operators are incorporating more exotic varieties like basmati, jasmine and texmati to meet their clientele’s diverse dining needs. FSD spoke to several operators about how they are incorporating three of these rices into their menus. 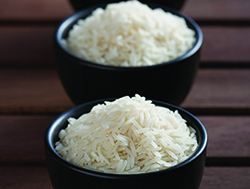 Perhaps the most commonly used of the more exotic rices, basmati is a great option for a wide variety of Asian and Indian dishes. At Miami University, in Oxford, Ohio, Eric Yung, executive chef, likes to use basmati in his pilafs because of how well the grains separate, so they don’t get sticky. For a recent Diwali celebration, the team used basmati rice for a pilaf that also featured saffron, fennel seeds, onions, celery, salt and pepper. Because basmati has such a distinct flavor it works well with anything that is anise based, Yung adds. He also likes to pair basmati with caraway seed for a non-traditional pairing, or saffron. Saffron is also a key component in El Camino Hospital’s basmati rice, which is served as a hot side with several Indian and Asian dishes such as red lentil curry and grilled mahi mahi, according to Executive Chef Jacques Wilson at this hospital in Mountain View, Calif.
At Ohio State University, in Columbus, vegan and vegetarian options are in high demand at the café located in the fitness center, according to Lesa Holford, corporate executive chef. One popular wrap featured saffron basmati rice, garbanzo beans, carrots, peas and peppers. Holford says the department sold 674 in three weeks, which she says is a pretty good sell rate for that location. The side of steamed jasmine rice, which is offered every day, is served with dishes such as grilled salmon with spinach and artichokes and grilled mahi mahi with ginger, cilantro and lime. At Miami University, Chef Yung’s team serves jasmine rice with many of the university’s Thai offerings, such as Thai chicken skewers. Ohio State’s Holford also uses jasmine rice in a cold composed salad. One popular option features purple jasmine rice with pears, dried fruits and a curry vinaigrette. “It’s a real simple salad, Holford says. “The students really like the eye appeal of the purple jasmine. We’re trying to figure out how to incorporate some winter vegetables in it so it can go beyond the season.” Holford will add dried fruits when they are on hand. Yung says texmati rice is good to try because it has great flavor profiles and is actually less expensive than basmati. Texmati is an American hybrid of basmati that is grown in Texas. Yung is also planning to introduce another non-traditional rice: red rice. The red rice will be prepared as a pilaf, with a vegetarian stock infused with an Asian profile.